Tillerson is said to need to attend to pressing issues back in the U.S.
Secretary of State Rex Tillerson is cutting short his trip through Africa, even as he continued to try to make up for President Donald Trump's comments and policies that have offended many of the countries' leaders. The nation's top diplomat has to return one day early because of "the demands of work and the need to be in Washington for in-person meetings" on North Korea and tariffs and for testimony on Capitol Hill Thursday on the State Department's budget, according to Under Secretary of State for Public Diplomacy and Public Affairs Steven Goldstein. But as he combats the perception that the administration doesn't care about Africa, Tillerson is departing early to deal with pressing issues back home, where he seemed out of step with his boss on tariffs - which he opposes, but Trump is set to implement - and North Korea - where he urged caution, but Trump agreed to talks. But especially after canceling his activities on Saturday in Nairobi, Kenya, Tillerson risked further offending some. Tillerson faced tough questions again on Monday about the president's policies and his reported crude comments in the Oval Office in another display of his job battling the perception that the Trump administration does not have a coherent Africa policy. (Jonathan Ernst/AFP/Getty Images) U.S. Secretary of State Rex Tillerson shakes hands after a news conference with Chad's Foreign Minister Mahamat Zene Cherif in N'Djamena, Chad, March 12, 2018. In January, Trump referred to African nations and Haiti as "s---hole" countries and asked why the U.S. couldn't take in more immigrants from countries like Norway. Trump eventually denied using the term, but his secretary of state has taken tough questions during his first tour of the continent about those remarks. After more than a year in office, Tillerson finally visited Africa, becoming the highest-ranking Trump administration official to do so. 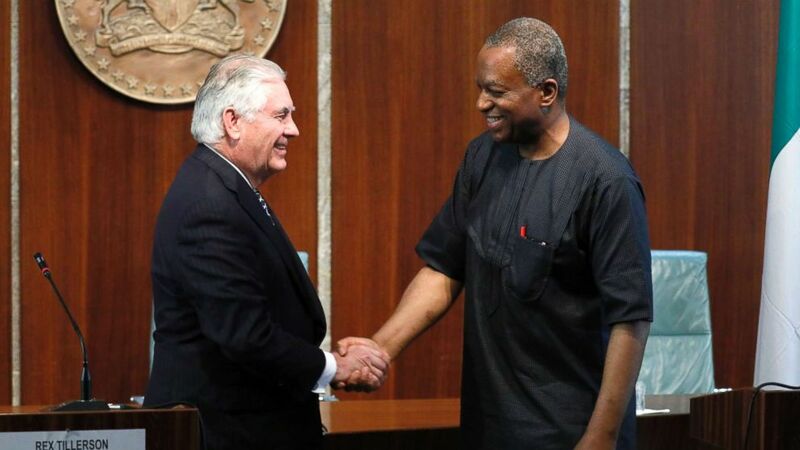 (Jonathan Ernst/Pool via AP) U.S. Secretary of State Rex Tillerson and Nigeria's Foreign Minister Geoffrey Onyeama shake hands after their news conference in Abuja, Nigeria, March 12, 2018. But Tillerson was also challenged over Trump's policies, especially in Chad, which was listed on the administration's third version of the travel ban. On September 24, just as its second ban on issuing visas to citizens of six Muslim-majority countries was about to expire, the administration issued a new proclamation on seven countries -- Iran, Libya, Syria, and Yemen of the original bans, plus Venezuela, North Korea, and Chad. Nearly six months later, with the ban still in place, Chadian President Idriss Déby made his anger known. "The president expressed his incomprehension in this measure" to Tillerson, Foreign Minister Zene said Monday after their meetings. 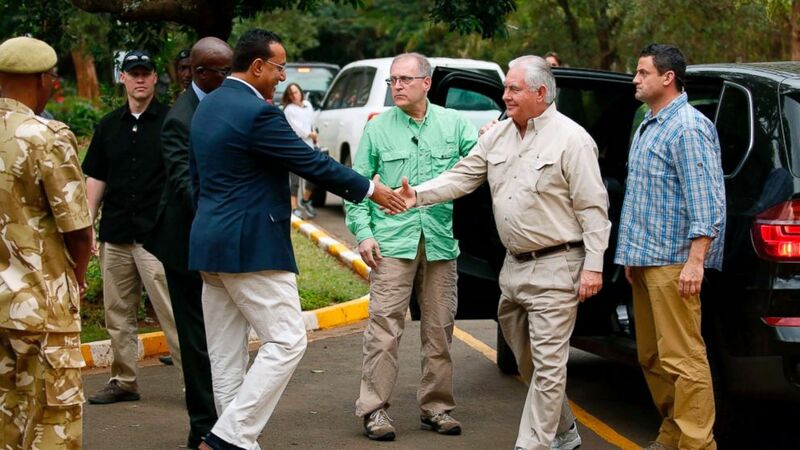 (Jonathan Ernst/AFP/Getty Images) Kenya's Cabinet Secretary for Tourism Najib Balala (2-L) shakes hands with US Secretary of State Rex Tillerson (2-R) prior to a tour of the Kenya Wildlife Service in Nairobi, on March 11, 2018. Tillerson opened the door to Chad's removal, saying it had made progress in addressing the U.S. concerns, including greater passport control and information sharing on suspected terrorists. 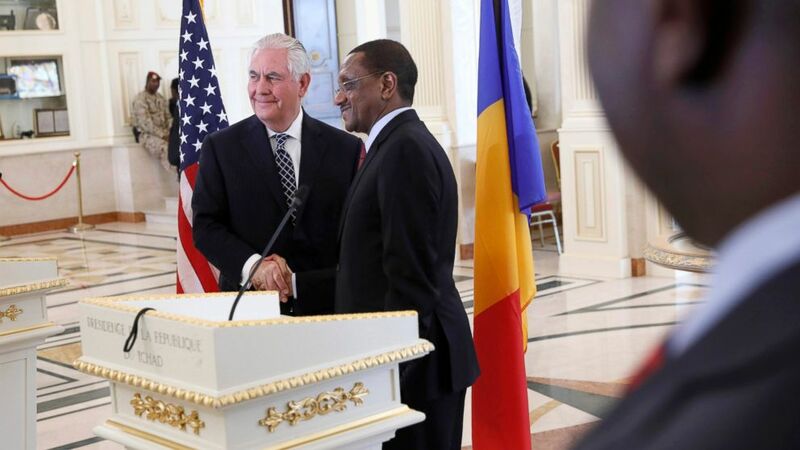 "All of these areas have been addressed by Chad, and significant progress made in our most recent engagement late last year" when officials from the State Department and the Department of Homeland Security traveled to Chad and met with their officials, Tillerson said. "We're hopeful that we can return things to a normalization of travel status, but we'll have to wait for the final report" in April, he added, which Trump will review and then make a decision on. Tillerson's stop in Chad was also meant as a goodwill gesture. He is the first U.S. Secretary of State to visit the landlocked country. (Jonathan Ernst/AFP/Getty Images) U.S. 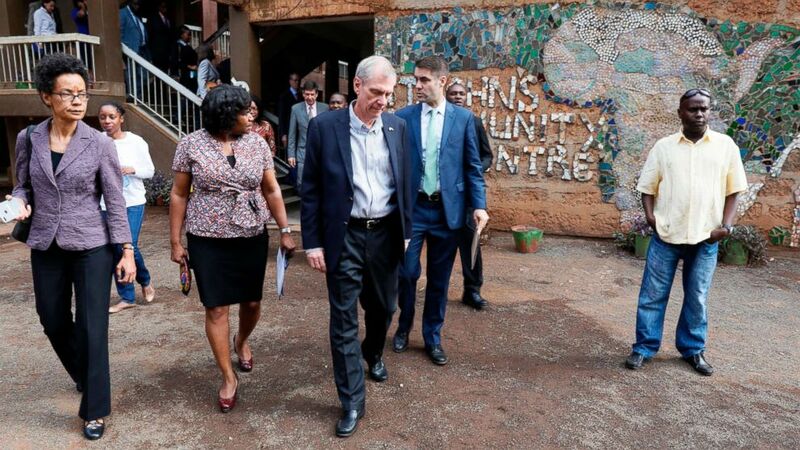 Ambassador to Kenya Robert Godec (C) visits a President's Emergency Plan for AIDS Relief (PEPFAR) project for girls' empowerment in Nairobi, March 10, 2018.